Anyone can suffer from the Shoulder Pain. So, it’s important to treat at the right time before you start suffering a lot. Here are some home remedies that you can do in your daily life to get relief from the shoulder pain. Hot compress is a right way to treat shoulder pain and inflammation. It is always good to do hot compress after 48 hours of the injury. Turmeric is a good remedy to get relief from shoulder pain. It is well-known for its antioxidant and anti-inflammatory properties which reduce pain and swelling. Ginger is a good source of antioxidant and anti-inflammatory properties that can help in reducing shoulder pain. It improves blood circulation that results in quick healing. In compression, some pressure is put on the painful area to reduce the swelling. You can compress the affected area with an elastic bandage or a warm wrap. A gentle massage can help your shoulder muscles release stress and tension. 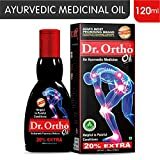 Moreover, you can also use Dr. Ortho Oil for massage to get relief from pain. If you liked reading this article – “Effective Home Remedies For Shoulder Pain”, do like it and share with others. You can share your views with us in the comment box below.